Prior to Decimalisation when our currency became pounds and pence with one hundred pennies in each pound we had a system of pounds, shillings and pence with the pound being worth two hundred and forty pennies. Looking back it was not the easiest of currencies to work with as we had 12 pence in a shilling, two shillings and six pence in half a crown coin, twenty shillings in a pound and twenty one shillings in a guinea and there was also the crown coin which was five shillings but was gone out of circulation before my time, The coins were made up of the half crown, two shilling piece, one shilling, six pence coin, three pence coin, one penny coin, half-penny coin and the farthing which was a quarter of one penny. Then we had the ten shilling note, the pound note, the five pound note, the ten pound note, the twenty pound note, the fifty pound note and the one hundred pound note. Under the new system, the pound was retained but was divided into 100 new pence, denoted by the symbol p. New coinage was issued alongside the old coins. The 5p and 10p coins were introduced in April 1968 and were the same size, composition, and value as the shilling and two shillings coins in circulation with them. In January 1970 the 50p coin was introduced in Ireland, with the ten shilling note withdrawn on 20 November 1970. This reduced the number of new coins that had to be introduced on Decimal Day and meant that the public was already familiar with three of the six new coins. Small booklets were made available containing some or all of the new denominations. The old halfpenny was withdrawn from circulation on 31 July 1969, and the half-crown (2s 6d) followed on 31 December to ease the transition. (The farthing had last been minted in 1956 and had ceased to be legal tender in 1960). All pre-decimal coins, except the 1s, 2s and 10s coins, were called in during the initial process between 1969 to 1972; the ten shilling coin, which, as recently issued and in any event equivalent to 50p, was permitted to remain outstanding (though due to silver content, the coin did not circulate). The 1s and 2s were recalled in 1993 and 1994 respectively. 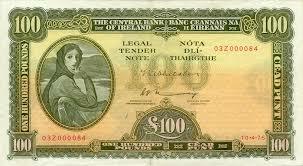 Pre-decimal Irish coins may still be redeemed at their face value equivalent in euro at the Central Bank in Dublin. 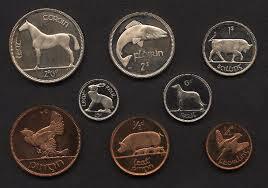 Pre-decimal Irish coins and stamps’ values were denoted with Irish language abbreviations (scilling (“shilling”, abbreviated “s”) and pingin (“penny”, abbreviated “p”)) rather than abbreviations derived from the Latin solidi and denarii used in other Sterling countries. Irish people and business otherwise used “Lsd” just as in other countries. Thus prior to decimalisation coins were marked ‘1p’, ‘3p’ etc. rather ‘1d’ and ‘3d’ as in Britain. Low-value Irish postage stamps likewise used ‘p’ rather than ‘d’; so a two-penny stamp was marked ‘2p’ in Ireland rather than ‘2d’ as in the UK. After decimalisation, while British stamps switched from ‘d’ to ‘p’, Irish stamps (but not coins) printed the number with no accompanying letter; so a stamp worth 2 new pence was marked ‘2p’ in the UK and simply ‘2’ in Ireland. When the old pounds, shillings, and pence system was in operation, the United Kingdom and Ireland operated within the Sterling Area, effectively a single monetary area. 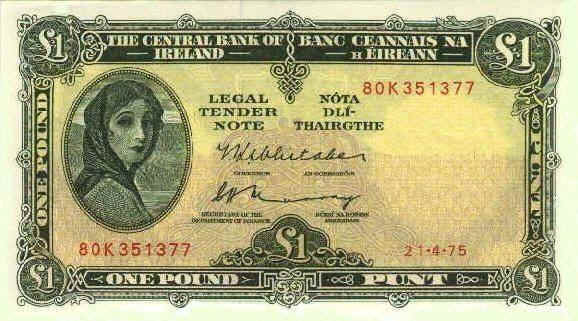 The Irish pound had come into existence as a separate currency in 1927, but the terms of the Irish Currency Act obliged the Irish currency commissioners to redeem Irish pounds on a fixed 1:1 basis, and so day-to-day banking operations continued exactly as they had been before the creation of the Irish Pound. 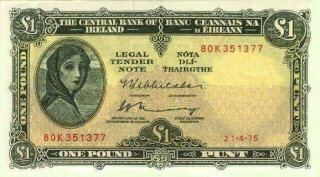 This state of affairs continued until 1979 when Irish obligations to the European Monetary System forced them to break the historic link with Sterling. It was a few years before my time but I always heard my father talking about shillings and ten bob notes.